QA Graphics, a full-service digital design company, is a recipient of a Gold Hermes Award in the Marketing Product category for their Dual Tank Whiskey Flask video. 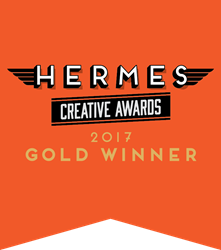 QA Graphics, a full-service digital design company, is a recipient of a Gold Hermes Award in the Marketing Product category for their Dual Tank Whiskey Flask video. To view the video visit: https://youtu.be/sEmiaf2yj94. The Hermes Creative Awards recognizes outstanding work in the marketing and design industry, with winners selected from over 6,000 entries worldwide. QA Graphics has over a decade of experience in 3D design and animation. By working with QA Graphics, Discommon Goods gained a video to be used as a tool in their marketing efforts that showcases their unique product design. Demonstrating the complexity and every detail of the flask, down to the exploding view of it’s156-components. This project allowed QA Graphics 3D Design team to demonstrate their vast talents and values in quality. The Hermes is an international competition, recognizing outstanding achievements by creative professionals involved in the concept, writing, and design, of traditional materials, programs, and emerging technologies. Winners are selected from 195 categories grouped under advertising, publications, marketing/branding, integrated marketing, public relations/communications, electronic media and pro bono. AMCP judges are industry professionals who look for companies and individuals whose talent exceeds a high standard of excellence and whose work serves as a benchmark for the industry. A list of Platinum and Gold Winners can be found on the MarCom Awards website at: http://enter.hermesawards.com/winners/.